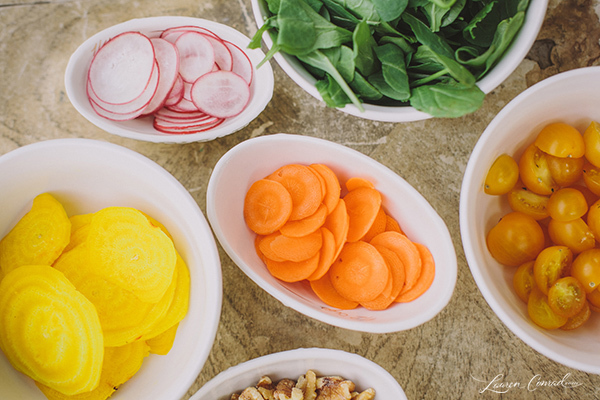 We don’t know about you, but when spring comes around all we crave are light and fresh foods. 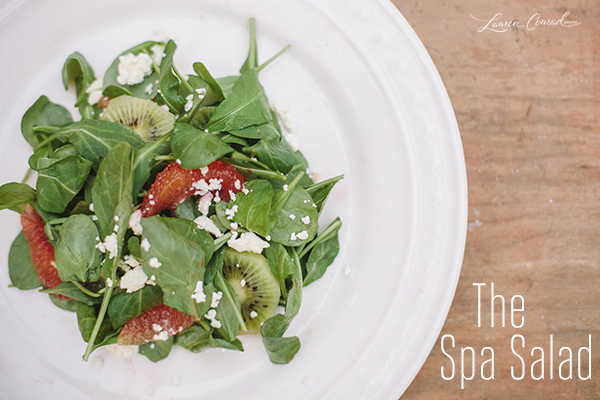 Produce is at its best and most abundant this time of year, and nothing tastes as yummy as a big green salad. But when we’re making salads at home, we’re not always as creative as we’d like to be. And we often get stuck in our same old kale-and-craisins rut… So, we enlisted chef Marlene Bernstein of Savour This Moment to share four seasonal salad recipes with the freshest spring ingredients. Peel the exterior of the carrots and beets and using a mandolin, slice the beets, carrots and radishes into thin rounds. Cut the tomatoes in half. Plate each ingredient vertically in a line right next to one another. Mix all dressing ingredients in a blender and pulse until the dressing has emulsified. Serve salad together with dressing. 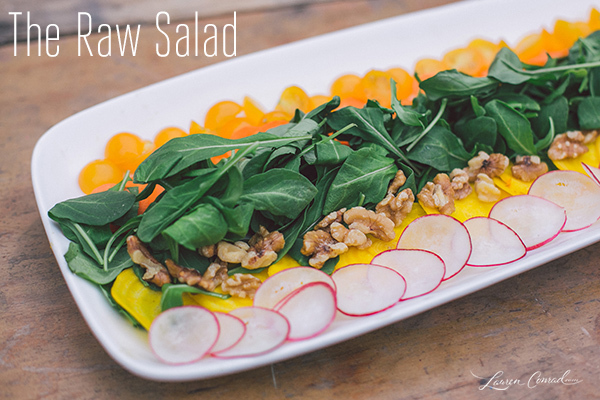 This delicious raw salad has many benefits including being rich in antioxidants, boosting immunity health, containing anti-inflammatory properties, increasing energy, promoting beautiful skin and numerous vitamins that improve your body’s overall function. To segment your orange, begin by cutting off both ends. Place the orange on one of the flat ends and using a sharp knife remove the peel and pith (the white part) until the flesh of the orange is exposed. The lines that separate each segment are now exposed, cut inside each line until the segment is released from the orange and you have a perfect segment. To create kiwi rounds, begin by cutting off both ends. Place the kiwi on one of its flat ends and using a sharp knife remove its fuzzy exterior. Next, lay the kiwi on its side and cut into rounds. Combine vinaigrette ingredients in blender and pulse until emulsified. 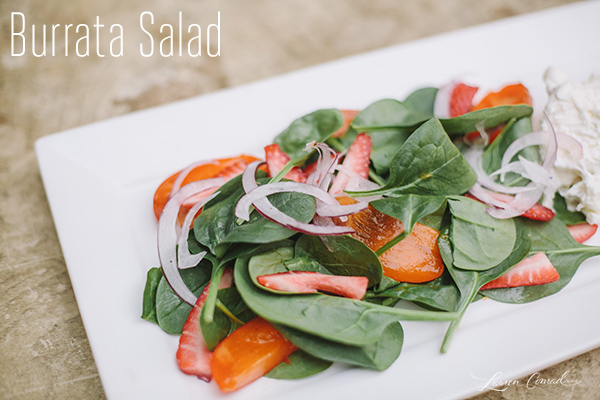 Assemble the salad by mixing together the arugula, blood orange, and kiwi. 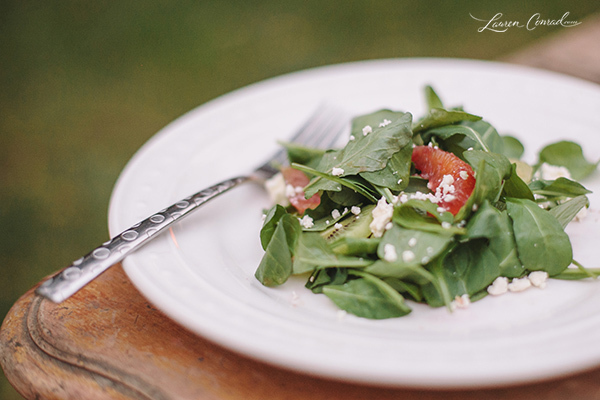 Toss with blood orange vinaigrette and sprinkle with feta crumbles. Bring either salted water or salted vegetable stock to a boil. Blanch broccoli and asparagus in the boiling water for approximately 30 seconds or until bright green, and then set aside. In the same pot of water, cook the couscous as you would pasta until it is al dente. 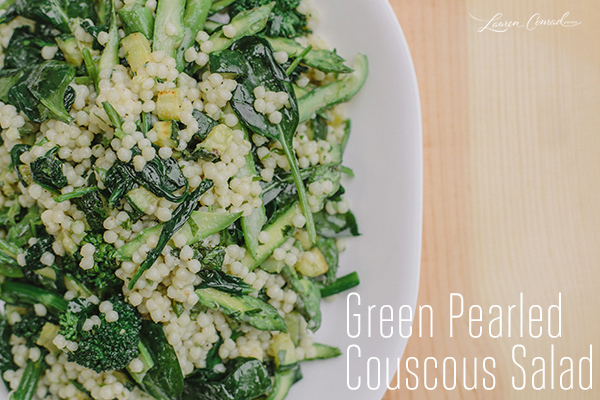 Strain, set aside, and toss with a light layer of olive oil so the pearled couscous does not stick together. Coat a saucepan with olive oil and sauté zucchini squash. Season with salt and pepper, and then place off to the side. Next, wilt spinach in a sauté pan and season with salt and pepper. Set aside. 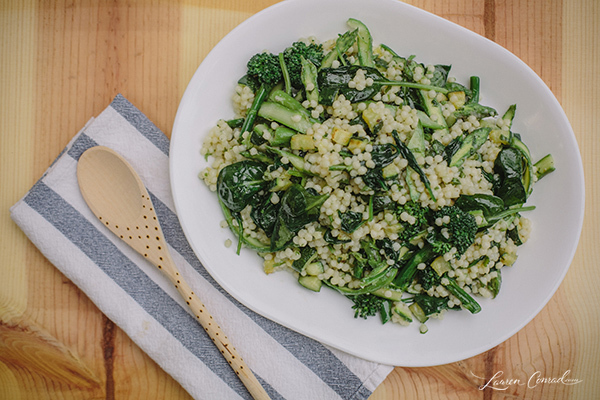 Mix couscous, broccoli, asparagus, spinach, zucchini and parsley together. Toss with your favorite vinaigrette. Place in the refrigerator until service. Serve cold or room temperature. Place burrata at the end of the plate. 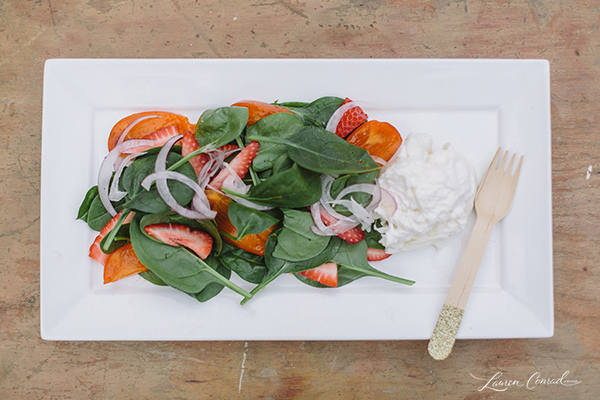 Mix together spinach, persimmons, and strawberries, and arrange next to the burrata. Spread red onion on top of spinach salad. Which one of these tasty spring salads are you going to try first?